Pretty interesting food & nice decor with some masterpieces. Situated on the top floor of Sayaji Hotel, the restaurant gives a bird’s eye view of the city. It is open air & has natural heaters – wood-fire pits for cold winer evenings. When my friend suggested that we go for Mediterranean food, I asked ‘Is the environment noisy or we can sit & talk? We finally decided to go here – Food was not my agenda as we needed to discuss something important. 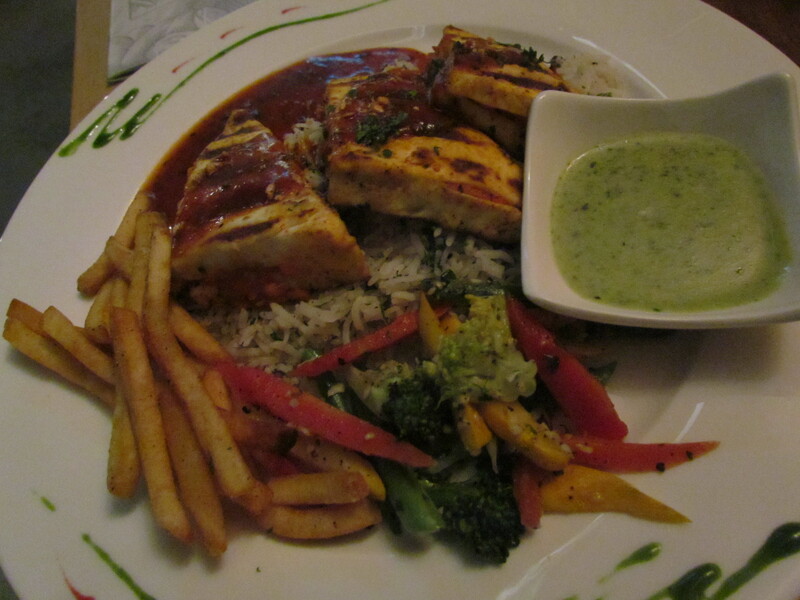 I had low expectations from a Mediterranean Restaurant at Indore – with the background that even in a ‘full of restaurants’ city like Delhi, it is difficult to find outstanding Mediterranean food. 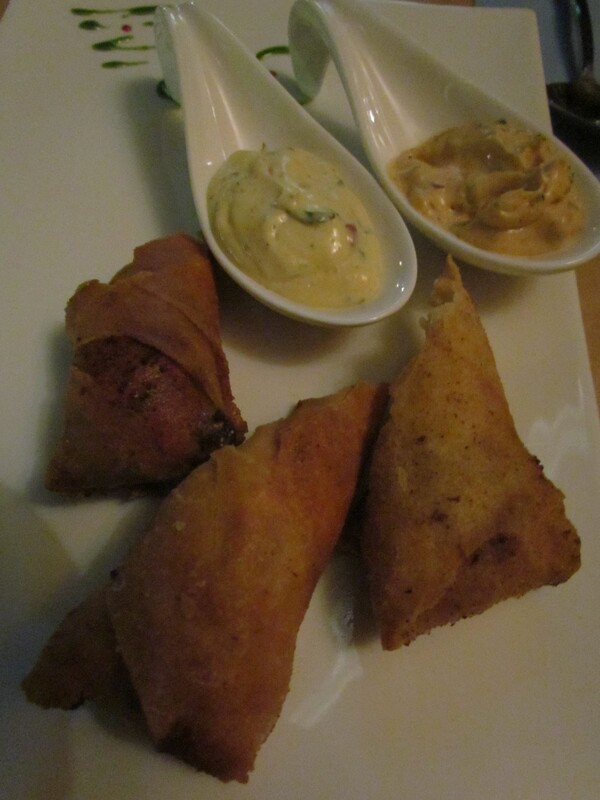 The starter platter was quite ordinary, the prawns in arabian spices was mind blowing good, so was tehlamb rack, vegetarian phyllo wrap was very good & the Marinated Cottage cheese with stuffing of parmesan & sundried tomato was quite interesting. Before the meal arrived, we were served a platter that was on the house – all looked good but turned out to be very ordinary. 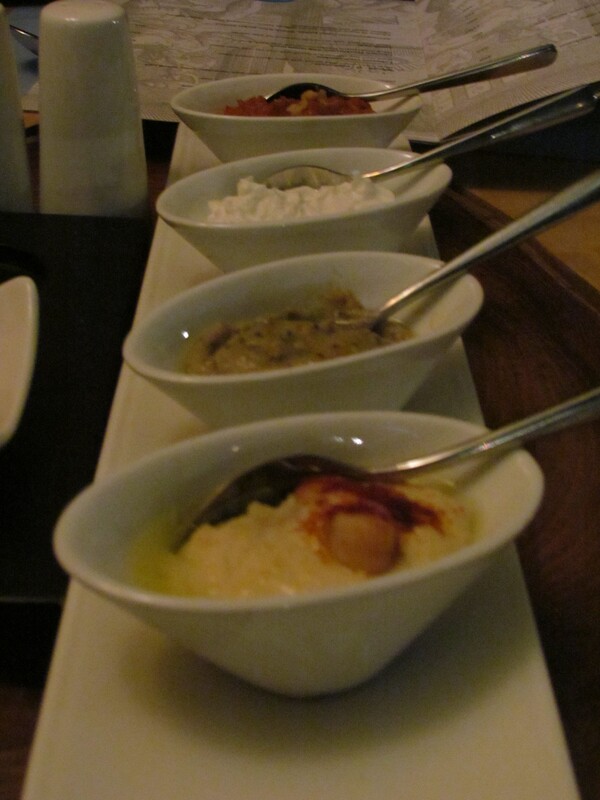 Dip made with Belle pepper paste, a hung curd & grated cucumber that tasted exactly like hung curd & grated cucumber!!!! A paste made out of aubergines & herbs (similar to baingan ka bharta) & hummus – look forward to a Hummus recipe that u can make at home & it will taste much better than this – coming up soon on yummraj. The ensemble also had golden fried garlic in olive oil, sun dried tomato in olive oil & some excellent breads of different shapes & sizes. 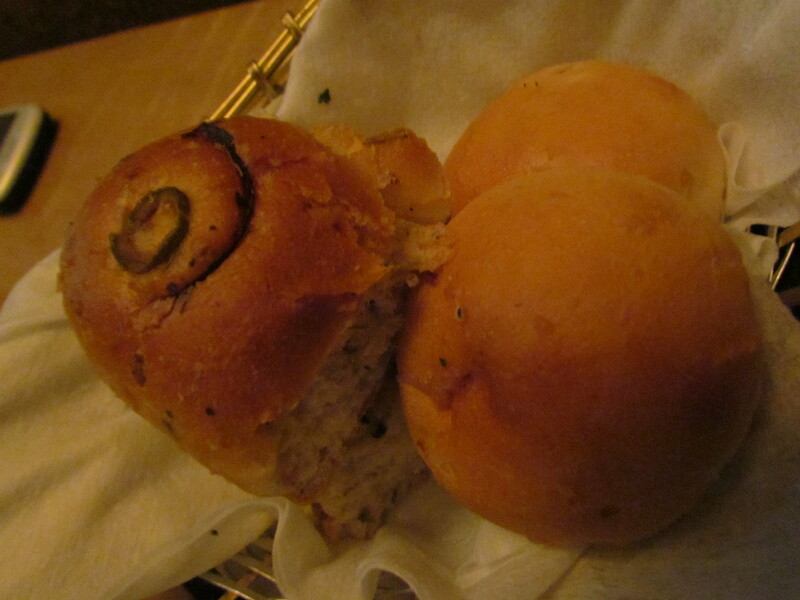 Only the plain bun kind of bread was bad – not soft, not warm & almost tasteless. In fact it is so hard that if it falls from the table, u might hear a thud as well!!! 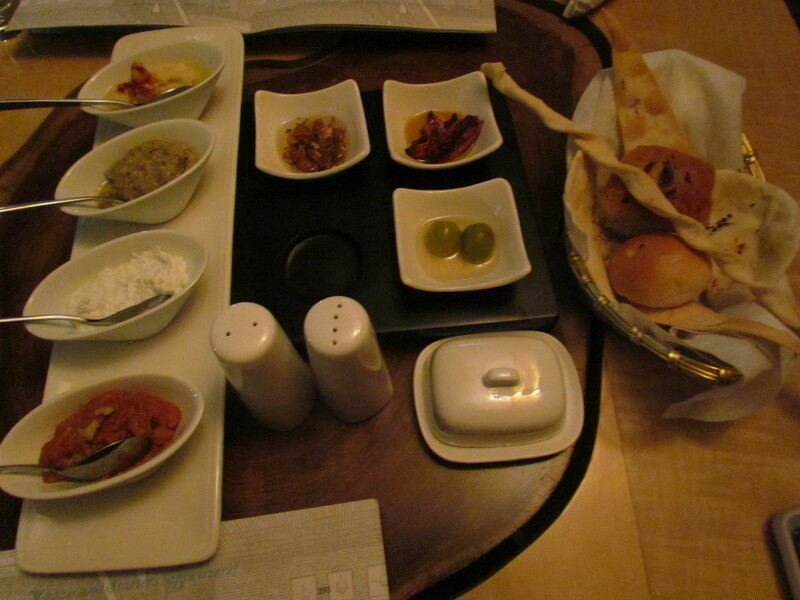 For starters came Rubyan Mashawi prawns – marinated in Arabian spices. This was the first instance when I started taking the place eriously. That feeling increased with every bite – soft, tasty prawns marinated in Arabian spices & herbs. 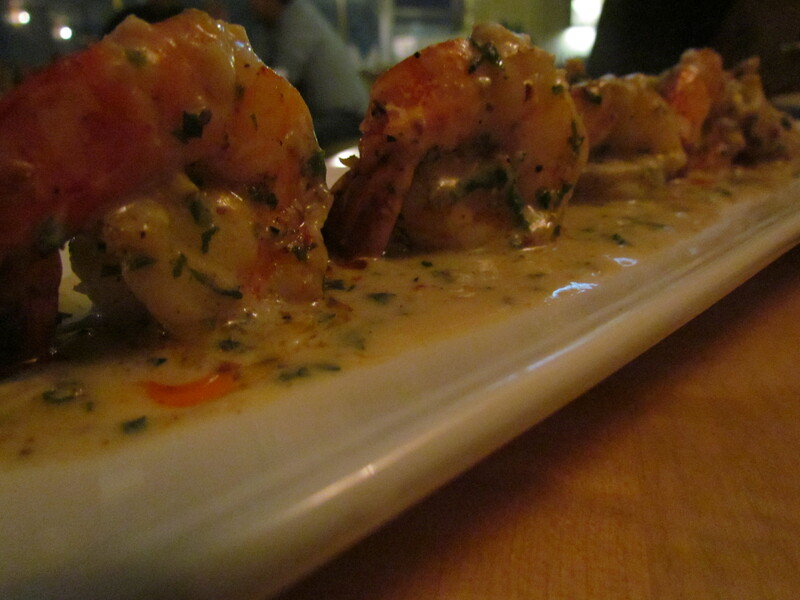 The sauce had a buttery texture & with every bite the prawns were bursting with flavors & juices inside the mouth…………..Magical. The plate was wiped off till the last drop. Post this sudden unexpected experience, I requested the Serving staff to suggest something between a lamb rack & a grilled salmon. I said ‘After such a great experience the next dish should be as good or better. He did not want to take a risk & hence the Chef was there with us. He suggested the lamb Rack. 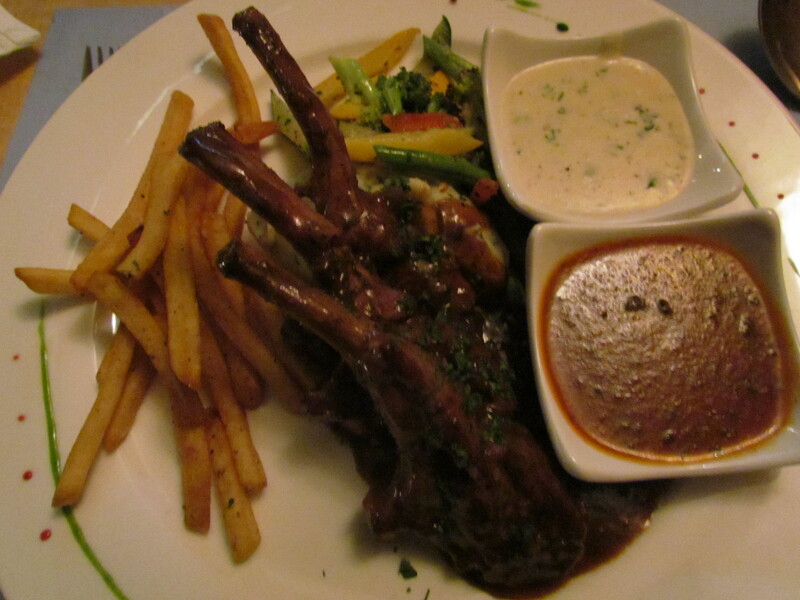 The lamb rack was soft, juicy & super tasty. It came with three sauces served in small bowls. One was a cheese sauce – a bit runny & hence suboptimal. The rest two were too good. Special mention to the barbeque sauce that was prepared in-house. My vegetarian friend was having phyllo wrap with four kinds of cheese. It turned out to be something like a spring roll with veggies & cheese filling. The outer layer was super thin & super crispy, thus adding a cool texture. Tasted good. This came with a cool mayonnaise based red bell pepper dip. For main course he had Marinated Cottage cheese with stuffing of parmesan & sundried tomato. This was served on a bed of fried rice. Compared to the Phyllo this was not as exciting but was good on its own. We washed down all these with an enjoyable & potent fresh lime soda sweet & salt. Overall, I am very likely to revisit this place.